On December 20th, the Board of Governors of the Federal Reserve System (“Board”) and the Federal Deposit Insurance Company (“FDIC”) (together, the “Agencies”) issued feedback and other guidance regarding the resolution plans (or living wills) of 12 global systemically important banks (“GSIBs”).1 Specifically, the Agencies finalized guidance (Final Guidance) to the eight US GSIBs2 regarding the firms’ resolution plan submissions, which are next due July 1, 2019. The Agencies also issued firm-specific feedback to four non-US GSIBs3 regarding the firms’ most recent resolution plan submissions (“Feedback Letters”). The Feedback Letters indicate that the resolution plans of the four non-US GSIBs have weaknesses, but not “deficiencies” that are “severe enough to result in additional prudential requirements if not corrected.” The Agencies are requiring the four non-US GSIBs to address these “shortcomings” in their next resolution plan submissions, which are due July 1, 2020. This alert provides an overview of these significant actions related to resolution planning in the United States. However, the proposal significantly updated two sections of the 2017 Guidance: payment, clearing and settlement (PCS) activities and derivatives and trading activities. Many aspects of the Final Guidance are largely unchanged from the proposed guidance. Notably, the Agencies did not materially revise the capital or liquidity sections of the proposed guidance.5 However, the Agencies noted that they intend to propose for public comment additional guidance or regulations regarding resolution liquidity and internal total loss-absorbing capacity. The Agencies added that they continue to consider a number of the comments raised in those areas, including comments related to secured support agreements and less prescriptive assumptions regarding liquidity flows (e.g., assumptions related to resolution liquidity adequacy and positioning (RLAP) and restrictive market access post-recapitalization). In response to comments that secured support agreements may be used to reduce pre-positioned resources at material entities, the Agencies stated that the agreements “remain an imperfect substitute for the certainty and transparency provided by pre-positioned resources” but that they will continue to coordinate with non-US regulators regarding developments in the resolution capabilities of US GSIBs and in the existing agreements. The Agencies also did not explicitly state that the single point of entry (“SPOE”) strategy is a credible resolution strategy for GSIBs, as requested by commenters. Rather, the Agencies responded that they do not “prescribe specific resolution strategies for any firm” and that the Final Guidance “is not intended to favor one strategy over another.” Similarly, the Agencies declined to modify certain aspects of the Final Guidance that would not be relevant in a successful SPOE resolution. For example, the derivatives and trading section of the Final Guidance maintains its expectations related to risk transfers between material entities, even if those material entities are expected to survive. The PCS activities section of the Final Guidance also retains the expectations regarding potential loss of access to PCS services, financial market utilities (“FMUs”) and agent banks even if the firm’s SPOE strategy does not include loss of access. Similarly, the Agencies did not eliminate the separate resolution planning requirement for insured depository institutions (“IDI Plans”) of firms that have adopted an SPOE strategy. However, the Agencies noted that the FDIC plans to address IDI Plan requirements through an advance notice of proposed rulemaking in 2019. The Agencies also declined to formalize the two-year submission cycle for resolution plans; such a change, the Agencies explained, would require amendments to the Agencies’ resolution planning rule and therefore be better affected through a separate proposed rulemaking. In response to support from commenters, the Final Guidance explicitly supersedes previously issued guidance and only incorporates those aspects of the prior guidance that the Agencies continued to deem applicable.6 The Final Guidance incorporates prior guidance regarding the format of the plan, assumptions of the plan (including access to the discount window), financial statements, and the scope of material entities. In addition, an appendix to the Final Guidance incorporates (with amendments) many of the responses to the “frequently asked questions” regarding the 2017 Guidance and identifies the other FAQs that the Agencies decided not to include. In contrast to many other areas of the Final Guidance, the Agencies made material amendments and clarifications to the PCS activities and derivatives and trading activities sections in response to comments. The Final Guidance clarifies that the determination of whether a client, FMU or agent is “key” (and therefore should be included within the PCS services analysis) should be made from the perspective of the firm rather than the perspective of the client. However, the Agencies did not limit the scope of “key clients” to GSIBs or similar categories of identified institutions, as requested by commenters. Rather, the Agencies confirmed that firms are expected to use both qualitative and quantitative criteria to determine key clients. Moreover, firms are expected to address potential contingency arrangements for key clients on an individual basis, where the client relationships or PCS services provided to the client are unique. The Agencies also indicated that firms have some flexibility with respect to the format and number of PCS playbooks. Specifically, firms may tailor the contents of their playbooks to allow for differences in the relationships between FMUs and agent banks. The Agencies also clarified that firms may provide a single playbook related to a particular PCS service if the firm is both a user and provider of the PCS service (as opposed to a separate playbook for each of the user and provider activities). Similarly, a firm would not be expected to provide a separate playbook for a PCS service if the resolution plan otherwise addresses all relevant expectations and provides specific cross-references to the PCS content. The Agencies also eliminated the expectation that playbooks provide analysis of the financial and operational impact to the firm’s material entities and key clients due to loss of access to an FMU or agent bank.7 However, the Final Guidance retains a number of expectations regarding contingency arrangements, including arrangements that would allow key clients continued access to PCS services if the firm loses access to key FMUs or agent banks or otherwise could not provide such access. The Agencies declined to make a number of other requested changes to the PCS activities section of the Final Guidance. For example, the Agencies retained the expectation that a firm would map each of its key clients to the firm’s key FMUs and key agent banks. The Final Guidance also retains the expectation that the firm describe its ability to control intraday liquidity inflows and outflows and to identify and prioritize time-specific payments, although the Agencies clarify that the liquidity analysis is not expected to include stress-testing or multiple scenario analysis. Amendments and clarifications to the derivatives and trading section of the Final Guidance include clarifying: (i) that information regarding compression strategies is expected to be included in the plan only to the extent those strategies are relied upon in the firm’s preferred resolution strategy; (ii) that a firm is not expected to model its operational costs for executing its derivatives strategy at the level of specific derivatives activities (but should not generalize the model to the material entity level); and (iii) that the expectations regarding the management of inter-affiliate risk and analysis of entities that enter resolution are limited to material entities (as opposed to all entities within the firm) that have a derivatives portfolio. The Agencies also clarified that firms are expected to include the derivatives portfolios of both material and non-material entities in its potential residual portfolio analysis. The Agencies declined to make a number of other requested changes to the derivatives and trading section. For example, the Agencies did not permit firms to rely on or cross-reference information the firm provides to the Board or FDIC pursuant to other regulatory requirements. The Agencies also declined to lengthen the 12-to-24 month timeline for stabilizing and de-risking the firm’s derivatives portfolio. Denial by the foreign parent of a request for financial resources is an inadequate escalation trigger. The Agencies determined that “exclusive reliance” on the discretion of management of the US operations to initiate a request for financial resources, rather than objective RLEN/RCEN levels, “poses the risk that available resources may prove insufficient and that time may run too short for the board and senior management to complete the prerequisite actions for entering into resolution.” The Agencies expect the firm to adopt adequate RLEN/RCEN triggers based on objective levels. The cited shortcomings make clear the Agencies’ expectation that an effective resolution plan should include objective escalation triggers that are based on projected levels of liquidity and capital that are deemed necessary to facilitate its resolution strategy (i.e., RLEN and RCEN). Another component of the four non-US GSIBs’ resolution plans is the mapping of shared services that support critical US operations (“critical services”), including the identification and mapping of critical services provided from affiliates or third parties located outside the United States. The Agencies cited inadequate mapping of shared services as a shortcoming for one firm because it “raises uncertainty” about the ability to maintain critical services to support critical US operations as would be required to execute the firm’s preferred resolution strategy. Given the interconnections between the legal entity rationalization (“LER”) of a firm’s US entities and its global legal entity framework, the Agencies intend to engage with the firm’s home country authorities to explore ways for home country and US resolvability concerns related to LER to be comprehensively addressed. Noting that the loss of access to PCS providers is a key vulnerability to the orderly resolution of the firm, the Agencies plan to solicit the views of home country regulators on ways to minimize existing differences in how the continuity of access to FMUs would be handled, particularly where access to an FMU is indirect. The Agencies also note that foreign banking organizations (“FBOs”) are increasingly booking derivatives positions originated in the US through their non-US affiliates rather than in US entities. The Agencies plan to review with home country regulators the potential for derivatives wind-down strategies that would enhance the likelihood that an FBO’s financial and operational resources, including derivatives positions held, will be transparent and positioned appropriately at the time of resolution. For all other FBOs required to continue to file resolution plans, the shortcomings cited by the Agencies in the Feedback Letters provide useful insight on the areas of focus of the Agencies in reviewing the adequacy of filed plans. The authors would like to thank Roseann Cook for her contribution to this alert. 2 Bank of America Corporation, The Bank of New York Mellon Corporation, Citigroup Inc., The Goldman Sachs Group, Inc., JPMorgan Chase & Co., Morgan Stanley, State Street Corporation, and Wells Fargo & Company. 3 Barclays PLC, Credit Suisse Group AG, Deutsche Bank AG, and UBS Group AG. 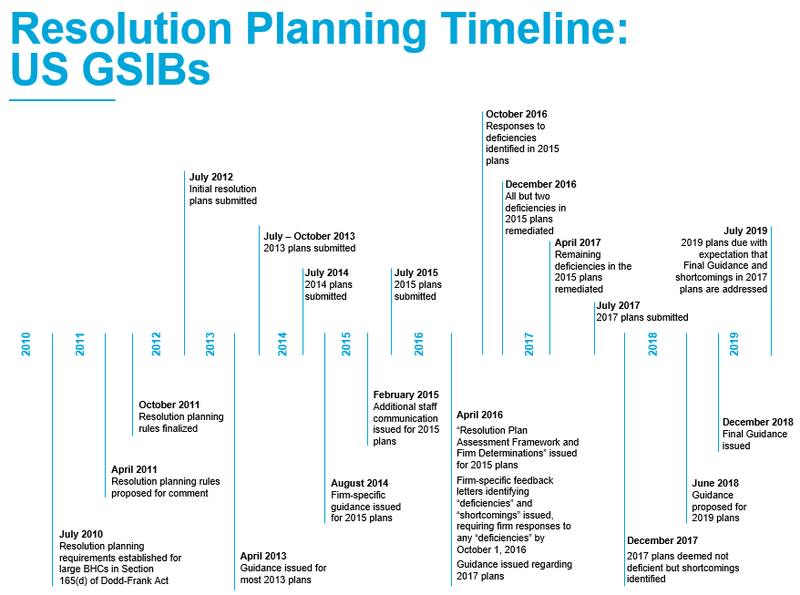 4 See Resolution Planning Timeline: US GSIBs above. 5 The Agencies also note that firms should assume conditions consistent with the Dodd-Frank Act Stress Test (DFAST) Severely Adverse Scenario but should have the capital and liquidity capabilities to adjust to actual conditions at the time of stress. 6 Specifically, the Final Guidance supersedes general guidance provided in 2013, firm specific feedback letters provided in August 2014 and April 2016, a staff communication issued in February 2015, the 2017 Guidance, and responses to the “frequently asked questions” regarding the 2017 Guidance. 7 The Final Guidance continues to provide that firms are not expected to incorporate a scenario in which it loses key FMU or agent bank access into its preferred resolution strategy or resolution capital/liquidity execution need estimates. 8 Incorporation of SR 14-18 entails a significant addition to the separability discussion in the Final Guidance. 9 See also US Resolution Stay: Covered Entity Compliance.